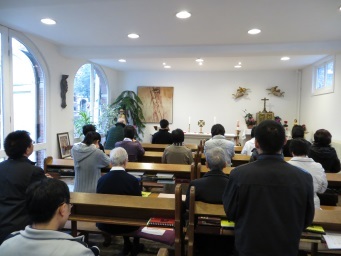 Since 2016 Verbiest Foundation has organized a Spring Encounter for Chinese parish priests from all over China; we try to bring together as many different dioceses as possible. It has become a moment for rich sharing and mutual interaction among pastors and with the European local Churches and their history. The encounter is facilitated in Chinese by different speakers on topics related to practical theology (Catechetics, Social Teaching, Spirituality, Homiletics...). When posible, a pilgrimage to the heart of western Catholicism is arranged so that participants can experience at faith level the meaning of communion and universality within the Universal Catholic Church. The activity is held during Easter time for a duration of a month aproximately. Around 30 people usually joins for the activity. The application is done the previous year, from August to November. If interested, please contact us HERE to send you more information.